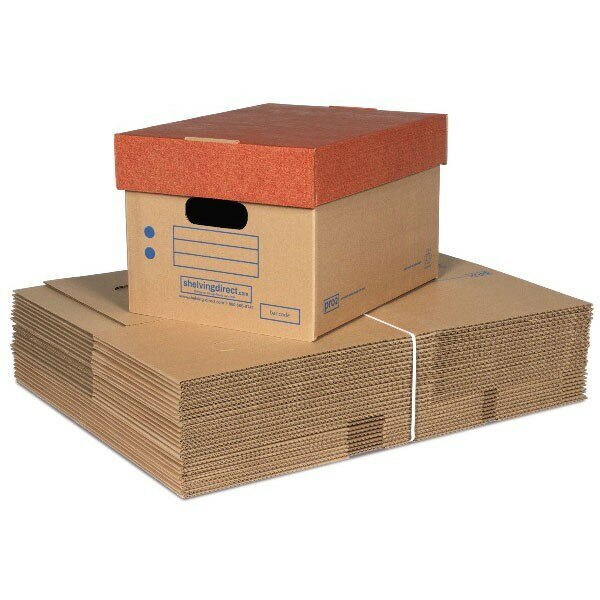 Cardboard boxes for filing and storage are the ideal solution for keeping all kinds of items in top conditions, although they are specially designed for archiving documents, such as files, folders, magazines, books, notebooks, etc. They include a handy lid that protects the contents of the box from potential damage caused by sunlight and accumulating dust, which is especially damaging to paper products. There are grip holes on the box for easy transport and handling, so they are also very useful during moves or shipping. Lidded cardboard boxes solve cost issues and the practicalities of filing or transportation of all kinds of products. Highly resistant: up to 200 lbs of load capacity per box. Double-wall sides and bottom for added strength. Supplied in flat packs of 25 units and are easily assembled in seconds. Space for labeling on the front. US manufactured traditional 1.2 cubic foot letter / legal corrugated document file box. Size: H-10" W-15" D-12". Environmentally friendly, with a high percentage of recycled paper. Edges of the lid are almost twice the standard length for added strength.